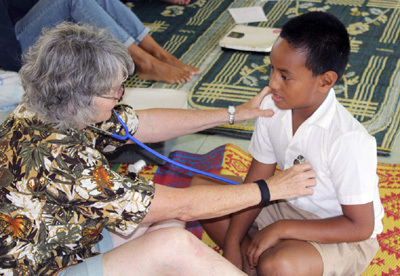 Each year there are hundreds of incredible health care volunteers that are unable to join Sea Mercy for a 2 week rotation. Some have given many years of their lives and talents to serve those locally and in 3rd world nations during times of emergencies (Katrina/Sandy - hurricane, Haiti - earthquake, Indonesia - tidal wave) and/or in service for those in need (Africa, South America, etc.). In order to say "thank you" for their sacrifice, we have created the Sea Mercy Volunteer Scholarship Fund that will be used to help cover a volunteer(s) costs. A future volunteer thanks you!